Nowadays you can buy white LEDs, which emit quite a bit of light. They are so bright that you shouldn’t look directly at them. They are still expensive, but that is bound to change. You can make a very good solid-state pocket torch using a few of these white LEDs. The simplest approach is naturally to use a separate series resistor for each LED, which has an operating voltage of around 3.5 V at 20 mA. Depending on the value of the supply voltage, quite a bit of power will be lost in the resistors. The converter shown here generates a voltage that is high enough to allow ten LEDs to be connected in series. 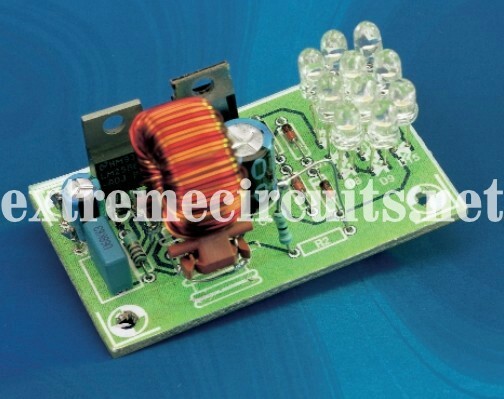 In addition, this converter supplies a constant current instead of a constant voltage. A resistor in series with the LEDs produces a voltage drop that depends on the current through the LEDs. This voltage is compared inside the IC to a 1.25-V reference value, and the current is held constant at 18.4 mA (1.25 V ÷ 68 Ω). The IC used here is one of a series of National Semiconductor ‘simple switchers’. The value of the inductor is not critical; it can vary by plus or minus 50 percent. The black Newport coil, 220 µH at 3.5 A (1422435), is a good choice. Almost any type of Schottky diode can also be used, as long as it can handle at least 1A at 50V. The zener diodes are not actually necessary, but they are added to protect the IC. If the LED chain is opened during experiments, the voltage can rise to a value that the IC will not appreciate.